I recently attended a press preview conducted by MIN New York. I’ve been meaning to go by the store and took the invitation as a sign I had better go. I’m so glad I did. This Crosby street alteier is a spacious emporium filled with goodies. I love discovering brands I’ve never heard of and they had quite a few like Linari and Parfums d’Orsay. What I love about the store is its openness. Not only is it a nice sized store but the staff is extremely nice. There’s no pressure and they’re available if you need them, but not in a stuffy stand-offish way. That open, transparent feeling carried itself through to my meeting with MIN’s owner, Chad Murawczyk. Perhaps my initial impression was shaped by his attire that day, he was wearing shorts and a t-shirt, but it was more so what came out of his mouth when explaining MIN’s curated selection of products. There wasn’t an ounce of pretentiousness and that made me feel welcome. We were two cats that connected on a love of scents and grooming products. I cannot say I’ve had the same experience in some of the New York’s other fragrance destinations. Explain the concept behind MIN New York? Inspired by the New York minute, MiN New York was created on the belief ‘The world doesn’t need more products. It needs better products.’ I wanted a place where you could escape the hustle of the City and slow things down to a space that offers a curated range of honest, artisan things that have endured the test of time. We wanted an Apothecary that respects the rituals of beauty and grooming. Where you could explore your personal style through the Art that is Perfume or shave. An Atelier that celebrates the senses and a Collector can find worthwhile additions. What is the history of the store? Who are the owners? How did they get into the business? I founded MiN New York back in 1999 on professional hair color and specialty hair care for men. MiN New York focused on identifying, formulating, and communicating effective solutions for everyday grooming challenges. I have been exploring bundled benefits and how efficacy affects time. Over the years, my passion and business evolved to defining simple luxury in the New York minute. Alas our Apothecary & Atelier was born! Our space is where I curate niche brands, fragrances, and curiosities. What do guys look for when they shop at MIN? What kinds of questions do they ask? Our Guests are savvy shoppers. They appreciate that true artisans make the products that we feature. Our customers know what they want and they are eager to explore. They want to know about the notes, the brands, and the inspirations behind each product or scent. They like it that we offer a well-edited selection and our collections evolve continuously. We’ve been told that having a choice to leisurely shop alone or receive a guided flight of personal fragrance is ‘a real treat’. We believe that it is important that our customers test fragrances on their skin prior to purchasing. Upon request, we help our Guests build a wardrobe of only what they love, what works for them. What are their top-selling fragrances for men? Miller Harris‘ Feuilles de Tabac [unique yet traditional] and Notte Bianca [rare, modern and complex] by Linari are a couple of our top sellers. Our customers enjoy scents that are distinctive yet unobtrusive. They appreciate fragrances that are made from the best ingredients by Perfumers, not laboratories. We are fortunate to have Guests that understand that fine fragrances are like wine and spirits. They appreciate our informative guidance and spend much time discovering new scents with our Guides. 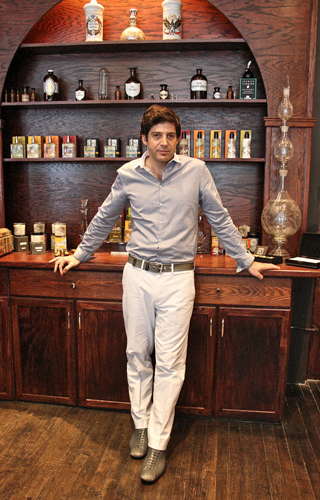 Unlike the department store environment, artisan fragrances are personal and very dynamic. We are thrilled to see that our Guests have fragrance wardrobes that tailor to various moods and external factors such as the weather. What are the most interesting men’s fragrances you have? Anything really different out there? Le Petit Rien by Miller Harris won ‘Best New Fragrance – Limited Distribution’ in the prestigious CEW awards in 2009. This timeless fragrance pays tribute to the great tradition of the cologne. Themed around the orange tree, it incorporates every element from the flower to the leaves. Sweet orange and angelica racine are fused with bergamot from Italy and Sicilian lemon, grounded with rosemary, red thyme, French tarragon and lavender. The heart is petitgrain essence and Tunisian neroli, whilst the base is oak moss, vetiver and patchouli leaves. The coolness of hesperidia alongside vetiver makes Le Petit Grain a supreme summer choice and a joyful morning addition for any in-between season. Frapin and Parfum d’Empire are 2 other striking collections that will be available this Fall. From these collections, many scents are very different and suitable for cooler weather. A great way to discover unique scents is to drop in for a flight or call up fragrance samples. My earliest recollection of fragrance was when my mother would head out for dinner with my father. She would check in with me and I would catch a whiff of Shalimar. It is quite a memorable and sophisticated scent. Currently, I wear Kilian’s Straight to Heaven, and Miller Harris’ Vetiver Bourbon. Yes. Paul Sebastian. It was masculine, refined and subtle. How would you finish this statement, “My most memorable fragrant moment would be…? This entry was posted in Interview and tagged CB I Hate Perfume, Chad Murawczyk, Fragpin, Grooming, Linari, men's cologne, Men's Fragrances, Men's grooming, Men's Scents, Miller Harris, MIN, MIN New York, New York fragrance stores, Parfum d'Empire, Paul Sebastian, Santa Maria Novella. Bookmark the permalink.